When the pipes in your bathroom or kitchen become clogged, you need to contact an expert clogged drain specialist in Apache Junction, AZ like us to do the job. If your kitchen sink or bathtub is draining slower than normal, we highly advise you to call us right away. 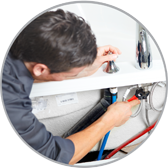 Our trained crew is very courteous and highly skilled and will arrive at your home prepared to do a full plumbing inspection. If you hire us, you can expect our technicians to properly diagnose the problem and fix it to your satisfaction. If your kitchen sink or bathtub or shower drains fail to flow normally, it is more than likely that your drainpipes are clogged with debris. Clogged drains can be annoying and can lead to flooding in your home if the problem is not corrected right away. Our technicians are well qualified and will provide you with professional services that will not be found any place else in the region. In most cases, clogged drains are caused by a buildup of grime and grease as well as food particles and trapped hair that will block the water flow. When this occurs, we suggest that you call our top-rate clogged drain specialist company today. You can trust us to do the job right because we well train our technicians and offer the most dependable plumbing services in town. If you want the clogged drains in your home to be fixed, we guarantee that we will not be beat by any other plumbing company in town. If you are looking for an experienced and efficient clogged drain specialist in Apache Junction, AZ, we assure you that you do not need to look any further than us. Our skilled technicians know what they are doing and will do a thorough job cleaning your clogged drains, so give us a call to schedule an appointment.